One of the most popular DJTT articles was a discussion in 2012 about choosing between modular setups or all-in-one DJ rigs. Despite the influx of tons of fantastic all-in-one controllers and standalone gear like the XDJ-RX, modular DJ controllers are still a very popular, affordable, and versatile choice. 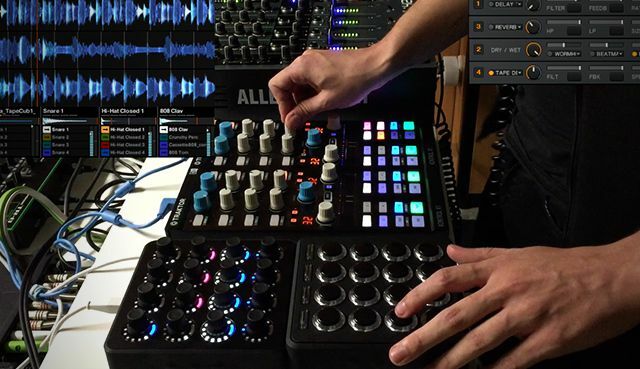 Today DJTT community member Belmont shows off how he mixes with a Midi Fighter 3D, Midi Fighter Twister, two Kontrol X1 Mk2s, Traktor, and any four channel mixer. Kontrol X1 MK2 – used to control four decks, FX control, Loops and Beatjumps. Midi Fighter Twister – used to control Deck D, sequencing drum beats. Midi Fighter 3D – used to trigger single-shot samples and launch some clips. Sennheiser HD25 – for monitoring. 4 port USB Hub – used to connect all USB devices. Note: Remix Deck FX only is activated in channel 1. Listen to more of Belmont’s mixes here on Soundcloud. Do you have any magic FX for the remix decks?